On the eve of his first official visit to Germany, Benedict XVI received unexpected praise from one of the historical leaders of Germany’s radical left, Gregor Gysi. Many criticize the Pope, “however, I would like to write about a different aspect, which I found interesting: contrary to his reputation of being a hard conservative, Pope Benedict XVI explains he is a theologian of the modern day,” Gysi says in a leading article written for the supplement “Christ & Welt” of the weekly magazine Die Zeit. The Pope sees two possible access roads to goodness, reason and religion, which in his opinion are both lacking. “No one would have reasonably expected to hear a Pope make such a statement on religion,” Gysi continues. 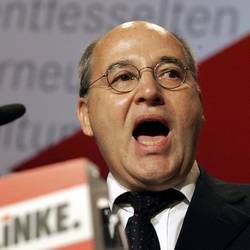 Gregor Gysi is leader of the alternative left party Die Linke at the Bundestag. His father, Klaus Gysi, was ambassador in Italy and the Vatican, Ministry of Culture and Undersecretary of Church Affairs in East Germany. However, it is specifically La Linke that is watching with a critical attitude the Pope’s visit to Germany, scheduled from September 22 to September 25, and in particular Benedict XVI’s speech at the Bundestag, expected for the afternoon of September 22. According to a parliamentary spokesperson a few members of parliament would leave the hemicycle as soon as Pope begins his speech or they may not participate at all. It is unclear, for now, how many of the 76 members of parliament belonging to the far left will take part to the Bundestag protest.